The fear of doing something that might have a negative impact in the long term, forces brands to focus on short term campaigns. Back in 1992, The city of Las Vegas had a problem. The Las Vegas Strip, with all its fancy casinos, was decimating downtown Vegas. So the city invited architects and planners to come up with ideas for the 'Las Vegas redevelopment competition'. 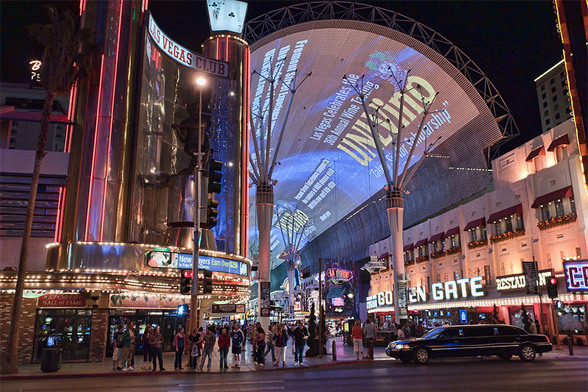 The result was what we today know as the Fremont Street Experience, which is just a mall. The 'experience' itself is a large canopy. It's 27 meters wide (90 ft) and 460 meters long (1,500 ft), with 12.5 million LED embedded displays. It's impressive, but not that exciting. And it wasn't the real winner of the competition either. The city wanted an entirely different and much larger project, but they where blocked by a CEO who didn't dare to take long term risks. What was the real winner of the Las Vegas redevelopment competition? It was a real-sized replica of the Star Ship Enterprise. The size of it was immense. The Star Ship Enterprise is the same length as the famous ocean liner RMS Queen Marry, the Eiffel Tower, or about 90% of the height of the Empire State Building. This was a great vision for downtown Las Vegas. It would have been a phenomenal success, considering that this was planned during the absolute highpoint of the Star Trek franchise. So why did they end up with a canopy with some pictures on it and not this remarkable project? The Las Vegas downtown redevelopment committee had made its decision, along with Mayor Jan Jones. I was called to a meeting and told, privately, that THE STARSHIP ENTERPRISE was the choice of the committee, but they wanted confirmation that Paramount would indeed approve the deal. While Paramount Licensing loved it, and Sherry Lansing (then President of the Studio) loved it, it was made clear to us that a decision of this magnitude would need to have the approval of the Studio CEO who, at that time was Stanley Jaffe. To make a long story short, Paramount (Licensing) and the redevelopment committee negotiated a basic deal, subject to the approval of the Studio Chairman. The Mayor of Las Vegas was involved and had also approved the basic deal. So everything came down to a major presentation at Paramount Studios on one weekday afternoon. The Mayor flew in on a private jet along with the representatives from the downtown redevelopment committee. Sherry Lansing was there, the Paramount Studios licensing group executives were there, several key executives at Paramount were there, and of course, Stanley Jaffe, the decision maker. To be clear, EVERYONE loved the project up to this point " the entire Vegas downtown redevelopment committee loved the concept, the Mayor loved it, the Paramount Studios Vice President of Licensing and the entire licensing department loved it, as did Sherry Lansing. Everyone loved it " but now it was up to one man. Stanley Jaffe. And I will never forget this meeting. All of our work, the effort to get Paramount, the Mayor, and redevelopment committee aligned, everything had come to this moment. We were ready to go. Money in place, land provided by the city, license for the property negotiated with Paramount licensing " all set. If Mr. Jaffe says "yes" and we are a "go" project. And the city wanted to have a press conference within a week announcing the project. "You know, this is a major project. You're going to put a full-scale ENTERPRISE up in the heart of Las Vegas. And on one hand that sounds exciting. But on another hand, it might not be a great idea for us ...for Paramount." Everyone in the room was stunned, most of all, me, because I could see where this was going. "In the movie business, when we produce a big movie and it's a flop ...we take some bad press for a few weeks or a few months, but then it goes away. The next movie comes out and everyone forgets. But THIS ...this is different. If this doesn't work ...if this is not a success ...it's there, forever..." I remember thinking to myself "oh my god, this guy does NOT get it..." And he said "I don't want to be the guy that approved this and then it's a flop and sitting out there in Vegas forever." Stanley waltzed out of the room and I think everyone was stunned. No one could believe it. But our dream pretty much ended there. Sherry Lansing was stunned and apologized to the room and followed her boss out. The Paramount licensing team was embarrassed to say the least, and of course, they were also realizing they had just lost out on millions of dollars in future licensing revenues too. The Mayor and the redevelopment committee were just depressed I think. But they thanked me for all the efforts I put into it, and for making the meetings with Paramount possible, and then they headed back to Las Vegas. So, with THE STAR TREK ENTEPRISE now officially off the table, the city awarded the competition to the #2 concept...the big rooftop "video screen" that became THE FREMONT EXPERIENCE ...which, while lacking the imagination, majesty, power and iconic nature of the STARSHIP ENTERPRISE, still managed to turn the downtown area around for about five years. So given that, imagine what the ENTERPRISE would have done. Fan or not, visitors to Las Vegas would have HAD to go see this and get their photo taken there. The fact is, had Mr. Jaffe approved the project, it would have been the most memorable project in his life, it would have been a financial boon to Paramount, still paying the Studio to this day. And it would have been a great part of his legacy, the Paramount legacy, and the Star Trek legacy. This is a remarkable story. Stanley Jaffe was perfectly willing to take short term risks in tiny packages, but when it came to long term risks, he froze. However, Stanley Jaffe is not alone. We see this every single day. Look at newspapers and magazines. Every single trend points to the fact the publishing in the future is digital in a connected world, so why are so few publishers embracing it? Most of the digital 'experiments' that we see today are not actually taking a risk. They are mostly short term experiments that only accounts for a small part of the media companies budgets or time. It's projects that can fail without any lasting effects. Or look at brands. Every single trend points to the fact that brands should spend the majority of their marketing budgets on digital and social channels. But most brands don't even come close. Why? Because digital is a long term risk. A print marketing campaign is something you can do fairly quickly, and if it fails, well, you just try again. But digital works by building a relationship and using the momentum to grow. A social strategy is not to do a fancy campaign that might or might not fail. It's a multiyear investment into creating a relationship that people care about. Most brands are making exactly the same mistake as Stanley Jaffe. The fear of doing something that might have a negative impact in the long term, forces them to focus on short term advertising campaigns. Remember Kodak, Blockbuster, or Borders? This was why they failed. They kept focusing on taking short term risks and neglected to embrace the long term changes. As the world slowly changed, their existing business model lost its momentum, and finally collapsed. Gaming industry: Perfectly willing to risk creating games, but don't dare sell the games directly on the XBOX. Instead, games are 6 to 12 months delayed to protect the old retail channels. Movie and TV industry: Perfectly willing to risk making new movies and TV shows, but are unwilling to risk streaming it directly to people. Book industry: Perfectly willing to risk publishing new books, but completely unwilling to embrace the connected book world. Newspaper industry. Perfectly willing to risk creating new sections or small changes to the format, but don't dare embrace the new world of personal news aggregation. Fashion industry: Perfectly willing to risk embracing new short term fashion trends, but most do not even have a web shop yet. Auto industry: For years they where perfectly willing to risk making new cars, but it took a financial crisis to get them to focus on hybrid or electric cars. Radio industry: Perfectly willing to risk making new shows, but not risk reaching people directly via podcast. Mobile phone industry: Willing to risk making new handsets, but they never risked changing the purpose of the phone itself (until Apple came along) ...It same with the PC industry vs the tablet. Short term risk is not actually a risk. It is just a continuation of the status quo. A real risk is one that moves you into the future. One that have a lasting impression, even if it is a failure. Yes it is. That is why it is called a risk!